Dragon Con 2016 marks my 20th visit to Atlanta’s marquee convention. Yes, I have been going to this show since I was 13, and was an excited Buffy the Vampire Slayer fan. I’ve gone to the show as a long-time fan, costumer, and even part of the Comics and Pop Art staff for a number of years, developing programming for that track. This year, I decided to do something wholly different, stepping back on all other responsibilities and try to engage a side of the show that was somewhat foreign to me – The Independent Film Festival. Since 2002, Dragon Con has held a film festival in a corner of the Hyatt Regency Atlanta (one of six host hotels that act as the collective home of Dragon Con in the cities’ downtown area). The festival, which showcases both locally made films, domestic productions, and even the occasional international offering, tends to hover around the genre interests of the show itself (fantasy, sci-fi, horror, animation, action, and even a comedy category). While the festival screened a number of features, including the Christopher Lloyd-starring I Am Not A Serial Killer, my focus (and time) really only allowed me the opportunity to dip into a few of the shorts. I made four separate visits into the animation, horror, sci-fi, and fantasy short blocks respectively. And while I think the content of each film varied in quality – there were a few productions from Japan in the sci-fi section that made me want to tear my hair out – I was instantly impressed with the production values on hand, and while acting was regularly spotty and an ongoing issue in about 50% of what I saw, there was real filmmaking promise on hand and I’d be delighted to take in a number of works from these creators again if the opportunity presented itself. Heard – Directed by David Howard – Heard is an animated short film following a frustrated artist’s journey through his own artistic development as he struggles to find his voice in a world built on silence. This short, which doubles as both a pseudo Euro-style sci-fi odyssey and a metaphor for artistic growth, was the first of the animated shorts to really grab me. I was taken with its confidence in vision, its clear purpose, and how – as the protagonist continues his journey – the visual stylings continue to evolve from simple line art to full fledged colored action. Under The Apple Tree – Directed by Erik Von Schaaik – Two brothers, an apple farmer and a priest, don’t get along. The priest is fed up with his peasant brother and his ugly apple orchard, dropping thousands of rotten apples in his neat little graveyard. The farmer is a gawky fellow, drunk on homemade cider, and deeply unhappy. 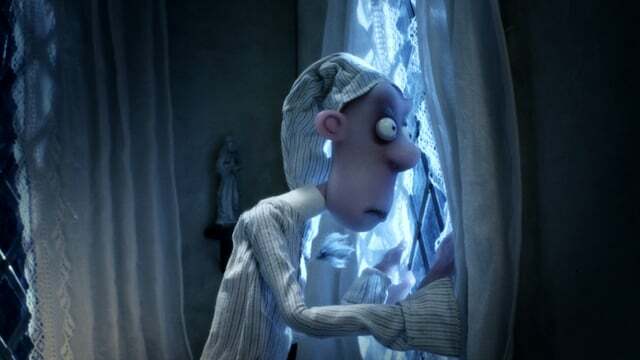 A very dark comedy from the Netherlands that plays to a sort of Wallace and Gromit-like aesthetic touch, but with suicide and zombies. I found this utterly delightful, particularly as it switches it focal point from the two brothers described above and over to the worms that inhabit the apples, and then eventually the dead brother’s body, and then other places. It’s probably the most twisted version of a Pixar-type concept (what do the worms that inhabit rotten things do on a regular basis?) that you’ll ever see. Corvalo – Directed by Anthony Ladesich – On a wave of Internet nostalgia, Corvalo, a former creature feature host, goes on tour to promote a reboot of The Crypt of Corvalo, his long-running regional television show. When his agent arrives, Corvalo hopes there is good news about his return to the small screen, but is informed that the show has stalled. Unable to quench his thirst for fame, Corvalo decides to reveal his true self and quench his thirst in other ways. Corvalo is an exploration of identity, a love letter to horror films, and an ode to creature feature shows of the 70s and 80s. A brilliantly fun concept can take you a long way, even with a short running time, and I was rather taken with the idea of “what if those old creature feature hosts were real monsters?”. It helps that Ladesich’s work was some of the tightest and best shot of the entire fest, and that the film also featured a appropriately twisted performance from its star Michael McQuarry. A clever little re-think of the Tooth Fairy legend, but by way of European folklore, where instead the fairy imagery is replaced by a mouse. And let me tell you, there’s nothing creepier than seeing a feral little mouse digging into somebody’s mouth to replace a tooth that was stolen from them. This horror short, by way of Luxembourg, packed quite a punch in its brief running time and had an ingenious little dilemma as its core. Legacy – Directed by Josh Mawer – A maverick neuroscientist, Lawrence, dies creating a mind-transfer device. His son, Edward, agrees to implant his father’s consciousness in his head and timeshare his body so Lawrence can refine his prototype. The work/life balance chafes at his girlfriend Sarina and adds a new dimension with his mother Jocelyn. Glitches increase in the prototype and foreign memories surface. Grappling with misplaced grief and a slipping identity, Edward tries to contact Lawrence before he has to make a difficult decision. While watching Legacy, I was instantly put into mind of a series like Black Mirror, which tackles the interaction between technological advancements and how it effects how we perceive one another and our social strata. This short played within that same ballpark, taking a look at how demarcate the boundaries of family while also provided a futuristic spin on Jekyll and Hyde. I loved it. It was the best feature I saw all fest, with terrific performances throughout and a haunting finale that left us all shuddering. Beautiful Dreamer – Directed by David Gaddie & Steven Kelleher – Facing a terminal disease, a mother uses space travel and relativity to stretch her last two years over the lifetime of her baby daughter, visiting for only one night every seven years. Mother and daughter must negotiate to build a relationship despite the longing and estrangement that mark the moments they are able to share. I basically call this “Mom Interstellar”, which is a very good thing by the way, as I think a mother’s perspective would have made that movie just a bit stronger (even though I loved it as it is). But this adaptation of a short story from author Ken Liu is imminently engaging and is one of the better realizations of a futuristic landscape that I’ve seen in an independently financed production. It’s helped along by the fact that Natalie Smith, who plays the adult version of the daughter in question, is terrific. It’s especially worth noting that she has to portray that character in three very different stages of her life. Both with the carefree moments of her young adult life, and the weariness of being a recently separated parent of two. I was less enamored with its final moments, which veered a little too far into the saccharine perhaps, but on the whole, this was well-made sci-fi. Collider – Directed by Paul Jenkins – When a young woman survives past her intended expiration date, she finds herself stuck in a loop, moving backwards and forwards in time towards the moment of her death in one direction and personal salvation in the other. Collider marks the newest live-action short from comics (among many other forms of media) creator Paul Jenkins. More of a “proof of concept” than a film on its own, this new sort of take on what happens after you narrowly avoid death (or don’t) had a very Lynchian feel, particularly in its use of backwards speech and general weirdness in an idyllic setting. Colliderfeatured my favorite approach to editing, with nicely timed cuts and a scattershot approach that I thought breathed a good deal of life into a pretty mediocre segment of fantasy-themed films, especially with an engaging performance from its star Hannah Fierman. Think Twin Peaksmeets the cinematography of something like Orphan Black, and that may give you a good idea of why this left me curious as to what comes next.